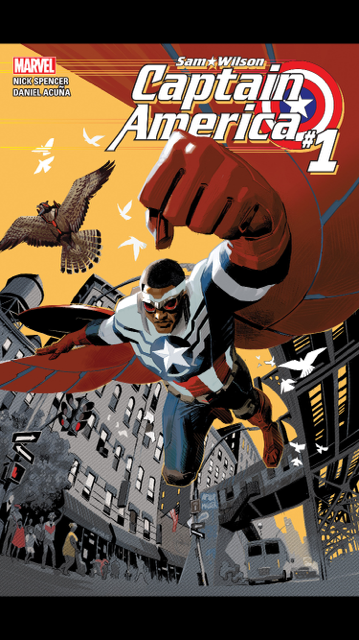 Are we ready for The Falcon to become Captain America? A Captain America without super-soldier serum passes his baton (or rather his shield) to The Falcon (Sam Wilson). All should be well and go on as planned and America will love him…right? In the first issue of Sam Wilson Captain America, this proves to be the opposite. In fact, the hatred and resentment is felt from the first few pages as Wilson sits on a commercial flight and interacts with some of America’s finest citizens. A stewardess refuses to serve him and others mock his presence. Writer Nick Spencer does a great job in expressing the internal battle that the new Captain America goes through. Wilson decides to take a political stance of sorts in front of America. With the best intentions in mind, Wilson receives backlash, harsh criticism, and is called a traitor to America. Even S.H.I.E.L.D turns their backs on him and he must act alone. A few allies aid Wilson in lone acts of heroism as he uses a hotline phone service to attempt to reach out to America. Will Wilson be successful in his is vigilante attempts as keeping America Safe? This series holds promise. Artist Daniel Acuna illustrates a great Captain America and delivers beautiful pages that compliments the emotion and drama with the storyline. 3.5 out of 4 hats. ← Beasts of No Nation – Add to your list!